Because you deserve a drug-free alternative solution. Weighted blankets have helped countless people with a wide-range of issues including: anxiety, insomnia, autism, stress, sensory processing, ADHD, Down Syndrome, Asperger's syndrome, brain trauma, PTSD, and acute crisis. Weighted blankets are regularly used by psychiatrists and occupational therapists as a tool to provide the user with pressure (proprioceptive input) which helps release serotonin in the brain quieting the fight or flight impulse and enabling higher level thinking. Similar to wearing a weighted vest, it's like getting a big, soft hug! 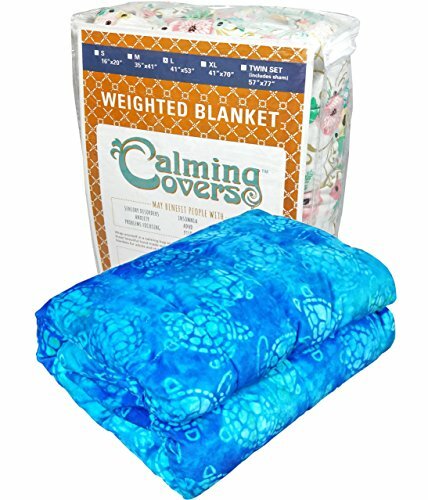 DOCTOR RECOMMENDED; Weighted blankets have been recommended by industry leading doctors and health professionals to help treat sensory processing disorders, anxiety, insomnia & more. YOU MAY BE LOSING HUNDREDS OF HOURS OF SLEEP EACH YEAR; The health effects of a lack of adequate quality sleep are frightening; Don't miss out on sleep that you could otherwise easily be getting if you had a weighted blanket. NO-LEAK PLASTIC FILLING: Unlike gravity blankets filled with glass beads or sand, our blankets are full of food grade plastic pellets (the same plastic beads used to make baby bottles and milk containers) which won't leak, are non-toxic, and safe around your baby, toddler, dog or cat. ONE SOLID PIECE, NOT A DUVET: No need to buy an inner blanket and separate, hard-to-assemble outer cover which will bunch, slip out of place, or tear after light use; Our therapy blankets are constructed as one machine washable piece. You don't have to buy a weighted blanket from us, there are some other good blanket manufacturers out there; be sure to do your research to get a quality blanket which you'll be happy with for a long time.